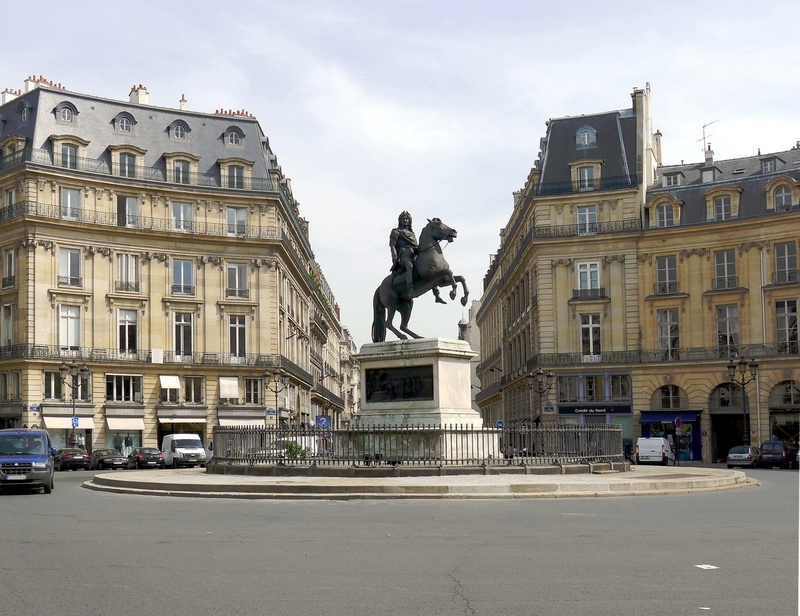 A little-visited but still quite scenic—and historic—site in Paris’s 1st Arrondissement is the Place des Victoires, a circular “square” that was created to honor King Loius XIV. Place des Victoires—located at the intersection of Rue Vide Gousset, Rue d’Aboukir, Rue Etienne Marcel, Rue Croix des Petits Champs, Rue Catinat and Rue de la Feuillade—is a short walk from the more popular Palais Royal, but few tourists make their way to this locale. And that’s mostly because aside from a large statue of Louis in the center of the circle, there’s no real “sight” to see. That’s a shame, because the circle has delightful 17th century architecture and, for history buffs, roots stretching back to the French royal House of Bourbon, and links to the French Revolution and Napoleon Bonaparte. In the late 1600s, Francois de la Feuillade, a French noble and military officer who eventually rose to the rank of Field Marshal, purchased all of the property in the area and demolished the existing structures. His goal was to both create expensive private homes for his wealthy peers and to honor King Louis XIV’s signing of the Treaties of Nijmegen, a series of favorable agreements that ended wars between France and the Dutch Republic, Spain, Sweden and Denmark. But work on the construction project gained the attention of the king, who took it over shortly after the demolition of the existing buildings had been completed. Under the direction of the royal Batiments du Roi (The King’s Builders) and royal architect Jules Hardouin Mansart, the current ring of uniformly designed buildings were constructed beginning in 1685. 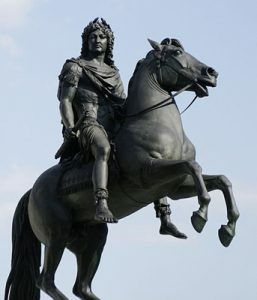 Louis was to be honored by an equestrian statue designed by sculptor Martin Desjardins, who was also charged with creating art for the gardens at Versailles. The gilded bronze statue showed Louis atop his horse, trampling the other powers that signed the Treaties while the defeated leaders of those nations glumly looked upon the scene. The triumphant statue was placed atop a pedestal and positioned it in the center of the square, which was officially named Place des Victoires. However, not long after its unveiling the statue became something of an international scandal and an embarrassment to the royal court. Other nations were incensed by the suggestion that the French had “crushed” the other signatories of the Treaties of Nijmegen, with some historians even suggesting the statue itself may have had a role in provoking future wars against France elsewhere in Europe. hose wars proved costly, bringing France to near financial ruin and leading to the 1697 Treaty of Ryswick, which saw King Louis XIV relinquishing nearly all of the territory acquired through the early Nijmegen accord and then some. The Desjardins’ statue of a conquering Louis quickly turned the king into a laughingstock both inside and outside of France. In 1792, the statue—as well as many other pieces of art and architecture honoring France’s royals—was destroyed during the French Revolution. A year later, the square was renamed the Place des Victoires-Nationaux and the site of the statue was filled by a wooden pyramid. That lasted only 17 years until Napoleon ordered that the pyramid be replaced by a bronze statue of General Louis Desaix, one of his most skilled military commanders. And that statue in turn was removed following Napoleon’s abdication in 1815 following his defeat at Waterloo. In 1828, King Charles X—who was briefly restored to power while the nation grappled with the effects of the French Revolution and the fall of Napoleon—ordered that the “Nationaux” be dropped from the Place’s name and that a new statue honoring Louis XIV be sculpted by Francois Joseph Bosio. This l12-meter-tall statue shows Louis atop a horse rearing on its hind legs. 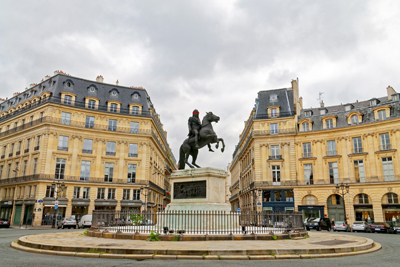 The Bosio statue still stands in the center of the Place des Victoires today and is well worth a short visit. And instead of housing noble families, the Place itself today is home to upper middle class Parisians and a host of trendy—and pricey—clothing and accessories boutiques. 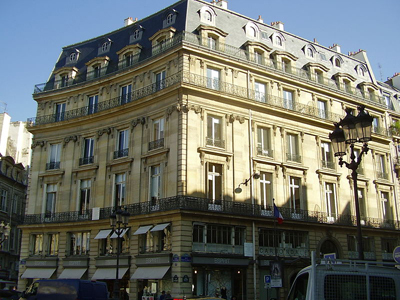 If you’re a shopper, be sure to check out such notable stores as Agatha, Kenzo, Cacharel, Hartford Homme, Claudie Pierlot, Gerard Darel, Lola and Zadig & Voltaire, among others. 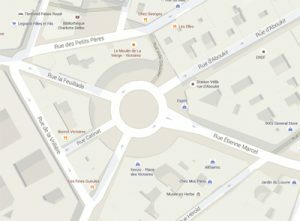 The intersecting streets are also chock full of other shops and boutiques, as well as a number of respected restaurants and wine bars, including Lemoni Café, Les Fines Gueules, Bistrot Victoires, Le Souletin, Les Elles and Chez Georges. Place des Victories is, unfortunately, several blocks from the nearest Metro stations: Bourse (the closest), Pyramides and Sentier. However, if you’re visiting the more popular Palais Royal, simply exit the north end of the gardens, turn right on Rue des Petits Champs and head east—the Place is just two blocks away. Another unpleasant reality of modern Paris is abundantly evident at the Place des Victoires—traffic. Because so many streets intersect the Place, there’s often a busy procession of cars, trucks and scooters circling the Louis statue. And, sadly, there’s no pedestrian crosswalk leading to the statue itself. So visitors should take great care when crossing into the heart of the Place to get a close-up peek at the Louis XIV monument. 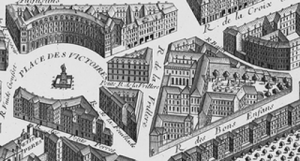 This entry was posted in Architecture, Beauty of Paris, Famous Paris destinations, French history, French Revolution, Hidden Paris, Louis XVI, Parks and Squares, Right Bank, Royalty, Sight-seeing and tagged Agatha, Bistrot Victoires, Cacharel, Chez Georges, Claudie Pierlot, Francois de la Feuillade, Francois Joseph Bosio, General Louis Desaix, Gerard Darel, Hartford Homme, Jules Hardouin Mansart, Kenzo, King Charles X, Le Souletin, Lemoni Cafe, Les Elles, Les Fines Gueules, Lola, Martin Desjardins, Napoleon, Palais-Royal, Place des Victoires, Place des Victoires-Nationaux, Rue Catinat, Rue Croix des Petits Champs, Rue d’Aboukir, Rue de la Feuillade, Rue Etienne Marcel, Rue Vide Gousset, Treaties of Nijmegen, Treaty of Ryswick, Zadig & Voltaire by Bob Adams. Bookmark the permalink.